Syed (pronounced Sy·ed) Amaanullah & Dr. Marlo Rencher join us for demo day featuring their new app, Snapsure. In this video, you’ll get a good look at how the app works, the idea behind it and a rundown on the events that lead to its creation. There’s a handful of wisdom to be shared here that could apply to any business, whether just starting out or not. We’ve all been there, trying on clothes in a fitting room, wondering how the clothes look on you, and deciding whether or not to make the purchase. It’s always helpful to have someone around to give you their opinion, right? Well, the core idea behind Snapsure came to Syed while feeling that same frustration. One year later, Snapsure, the instant feedback app was released onto the app store. After witnessing a short demo on the app’s usefulness, we continued to talk to Syed and Marlo about why they created this app, how they validated the idea, what lessons they learned and how they plan on moving forward. They discuss some of the great resources they used including the University of Michigan School of Information, who helped them validate their product, perform user experience testing, create an interaction map, and a lot more of the initial testing refining Snapsure into a strong idea. 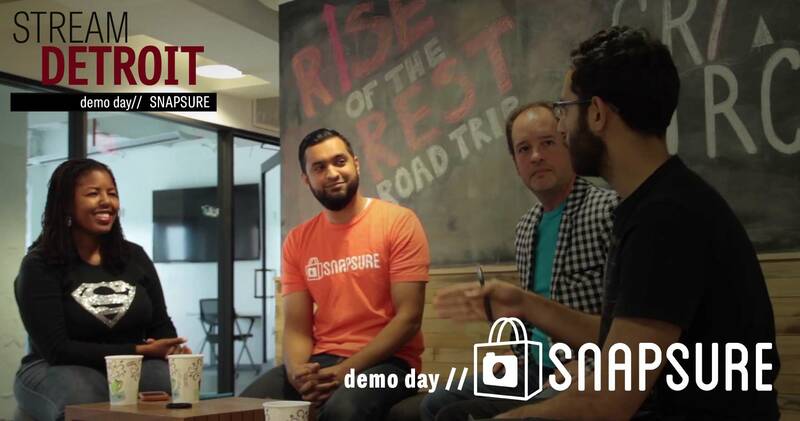 Join us and Snapsure, watch/listen to this demo day episode of Stream Detroit. To learn more about Snapsure and download the app, visit their website at http://snapsure.co.